Nuadas Spear | BUDK.com - Knives & Swords At The Lowest Prices! Officially licensed replica of the prop weapon used in the hit movie Hellboy II: The Golden Army. This is the spear of Prince Nuada and his preferred weapon of choice. 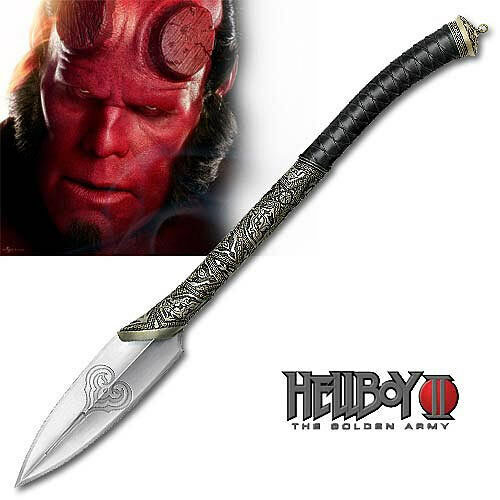 This exquisitely detailed replica of the movie prop measures 30" overall and features a mirror polished stainless steel spear blade and matching dagger. This collectible item is strictly limited to 5,000 pieces worldwide. The spear blade is individually serialized, and this item includes a black wood collector's plaque with the matching serialized number edition and a certificate of authenticity.